Although native to China, reliable Metasequoia megafossil records from only nine localities ranging from the Late Cretaceous to the middle Miocene have been reported in this country to date, most of them were reported from the northern part of China. Researchers from Xishuangbanna Tropical Botanical Garden (XTBG) have recently discovered numerous well-preserved leafy shoots and seed cones of Metasequoia from the middle Miocene deposits in Sanzhangtian, Zhenyuan County, Yunnan. It’s the first Metasequoia fossil record in Southwest China and the southernmost fossil record of the genus around the world. The fossil record has been published in Review of Palaeobotany and Palynology. Characters of leafy shoots, including the cuticle micromorphology of the leaves and gross-morphology of seed cones, unambiguously refer the fossils from Sanzhangtian to the genus Metasequoia. The Sanzhangtian fossils differ from other fossil-species of Metasequoia in seed cone phyllotaxis, which is exclusively decussate in the Sanzhangtian cones but mixed decussate–helical in the others. 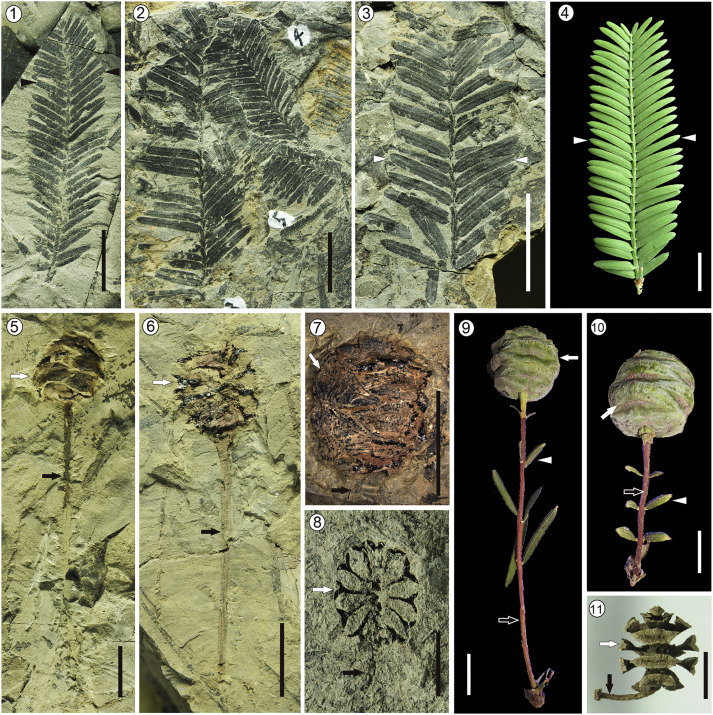 Judging by the great morphological similarity between the fossils and extant M. glyptostroboides, the researchers identified their fossil materials as Metasequoia sp. (cf. Metasequoia glyptostroboides). The researchers also found that the genus has remained morphologically static at least since the early Neogene. It was present in the Arctic cool temperate zone during the Eocene, in temperate zones, e.g., in Northeast China during the Paleogene as well as in nearly subtropical areas in Southwest China during the Neogene. “We regard that the disappearance of Metasequoia from Southwest China might be related to the evolutionary stasis of Metasequoi. The intensification of the Asian monsoon in Yunnan during the Neogene most likely prevented necessary adaptations of the plants to increasing winter and spring aridity,” said Prof. SU Tao, principal investigator of the study. Leafy shoots, leaves and seed cones of fossil Metasequoia sp. (cf. M. glyptostroboides) (1–3, 5–8) and modern M. glyptostroboides (4, 9–11).